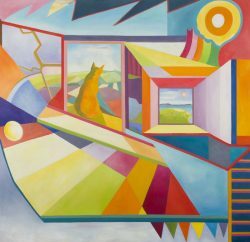 ARTISTS who belong to the Creative Coverage group are exhibiting at Bridport Arts Centre, until 4th August, in a group show called Dorset: Landscapes, Flora and Fauna. 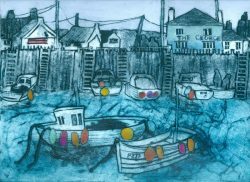 The mixed exhibition features scenes of Dorset landscape and coast, including oil paintings of West Bay, Portland and Long Bredy by George Paul Sainsbury, paintings by Ingrid Skoglund, Sean Curley, Caroline Liddington and Barbara Green, and botanical work by Sally Pinhey. Creative Coverage, which represents selected professional artists and craftspeople, is run by Tim and Caroline Saunders, who provide their members with opportunities to sell and promote their work. Pictured: Fishing Boats by Barbara Green; Hardy’s Monument, by Caroline Liddington. Posted in Private View on 6 July, 2018 .